I just finished taking a short, unannounced hiatus from blogging. I felt overwhelmed trying to figure out what to write about each week, plus it’s kind of crunch time at work right now as we finish up the January issue of O. Next week will be even busier, but this morning I realized that if I didn’t start writing again soon, I might never return. It’s so easy to let this passion project get swept aside to focus on things that need to be done—but sometimes it’s just as important and soul-affirming to focus on the things I want to do. During my time away, I realized I need a better posting schedule to keep myself more accountable, rather than just blogging when I feel inspired. It’s the same tactic I’m taking with personal writing projects: I’ve decided to do National Novel Writing Month again this year and have set a word count goal for each week (today’s day 3: I’ve got 1,794 words so far and am going to need to do some catching up over the weekend). So, with that in mind, I’m going to try to post as follows: Mondays will be for miscellaneous thoughts, whatever random things are on my mind to kick off the week or a recap of what I’ve been up to over the weekend. Wednesdays will be for posts about books, writing, reading, philosophical musings. Fridays (starting next week) will be all about food: recipes, restaurant reviews, gardening progress, etc. And I’ll try to intersperse those with holiday blurbs, follow recommendations, and anything else that pops up that seems worthy of blogging about. Of course, I might not end up sticking to that schedule, but I’ll at least try it out to see if it leads to more frequent posts, or even just more ideas. When one thing isn’t working, it always helps to experiment with something else. Hope you’ll all still follow along on this journey! I originally saw this post on Zeezee with Books, and since she’s so graciously tagged anyone interested in participating, I’ve decided to answer the ten questions as well. Without further ado, here we go! 1. What’s the most beautiful cover on your shelf? I love so many of them, especially given that I picked up many of these books because I was first attracted to their cover. 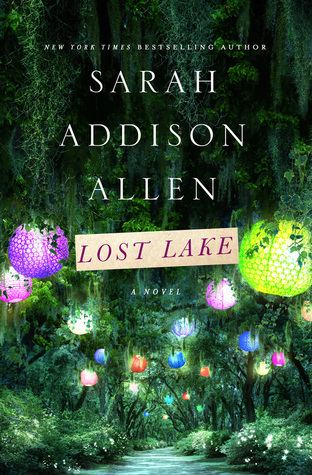 Right now the one that satisfies me most is Lost Lake by Sarah Addison Allen: the glow of the lanterns, the hint of darkness and mystery in the shadows and the stream. It helps that I really enjoyed the novel (I gave it five stars on Goodreads), though I generally like books by this author. 2. If you could bring any fictional character to life, who would it be? Jo March from Louisa May Alcott’s Little Women. I always admired her no-nonsense attitude and her writerly dedication, and I’ve long thought we’d be best friends if I met her in the real world. We have similar goals, and strikingly similar moral values, and I’d be interested to meet the character that Alcott most modeled on herself. 3. If you could interview an author, whom would you choose? Tim O’Brien. I did interview him once, several years ago, for amNewYork newspaper, and one of the things he said has always stuck with me: Read like a writer. Find the passages and characters that move you, and then think about why. I wish I’d had smarter questions for him at the time, and I’d love the chance to ask them now. 4. Which book would you not read again? More than I’d care to admit. One recent one I really couldn’t stand was The Little Paris Bookshop by Nina George. And in general I stay away from biographies (unless it’s about Hemingway, of course. In that case I’ve read at least three of them). 5. Can you name a confusing story? IQ84 by Haruki Murakami. I admire his writing and generally enjoy his books, but this one took a lot of effort to keep track of the story and figure out what was happening. 6. Your favorite fictional couple? Definitely Crystal and the character of Death in Tanya Huff’s Wizard of the Grove series. It’s so unique but also feels so natural, and I’ve always loved the idea of Death as a character with human emotions. Plus, this is one of my favorite books, and since childhood I’ve probably read it at least five times. I love the Gavin/Dazen characters in Brent Weeks’s Lightbringer series because you’re never sure which one’s the villain and which one’s the hero. Does that count as two? Because I can’t think of another right now. 8. A character you would kill or remove from a book entirely? Tom Buchanan in The Great Gatsby because I’ve always wanted Daisy and Jay to end up together. But I realize that would pretty much make the whole story a moot point, and anyway, Daisy would probably still end up choosing some other rich bloke over Gatsby, so what’s the point really? 9. If you could live in a fictional world, where would you choose? Krynn, the robust world in Margaret Weis and Tracey Hickman’s Dragonlance series (but before the fifth age of mortals comes around). It’s the first fantasy universe I really immersed myself in, and I still like to go back there from time to time to say hello to old friends and learn from these two masters of the genre. 10. What are the biggest and smallest books on your shelf? I’m sure I’m missing some, but Who’s Afraid of Virginia Woolf by Edward Albee must be one of the smallest. And as for longest, it’s probably the Hungarian-English dictionary I lugged back from Budapest with me. *Which book could you read a hundred times and not get tired of? And Then There Were None by Agatha Christie. I’m perpetually amazed at how well the whodunit is constructed. *If you could only recommend one book from all your shelves to a friend, which would it be? A Separate Peace by John Knowles. Throughout the years (starting in high school, when I found a way to use it as an example in nearly every AP English Lit & Language essay I wrote), it’s meant so many different things to me, and I’d hope someone else could find meaning in it too. Anyone is welcome to participate in the tag, but I especially tag A Bibliophile’s Obsession, The Tattooed Book Geek, Critquing Chemist, and my friend Bill at Harmony Books & Film.